Babies. Toddlers. So often we exclude these tiny humans from the messy, sensory sort of play because we think they aren’t capable, they aren’t big enough, or because we think they won’t really benefit from it. Well this is all malarkey. Babies and toddlers love this sort of play. They are capable of this sort of play. And most importantly, they will benefit greatly from this sort of play. 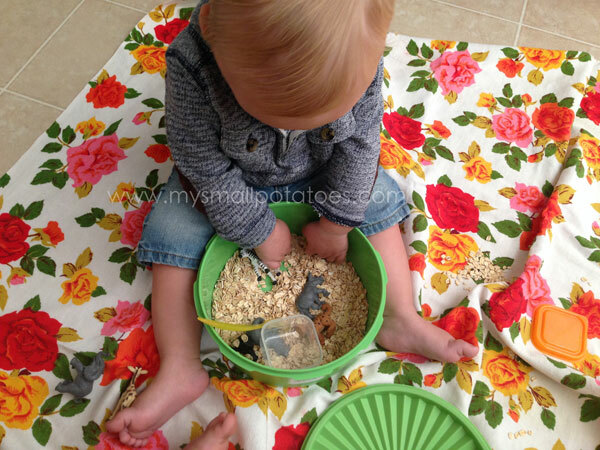 Babies and toddlers are sensory learners by default. They come into the world wired to touch, smell, taste, see, and hear…it’s how they learn. I try to make as many of the play experiences I have available to the preschoolers, also available to the toddlers and babies. Big kids paint, little kids paint. Big kids play in sensory bins, little kids do too. Are some of the materials different? Yes. But the experience is essentially the same. 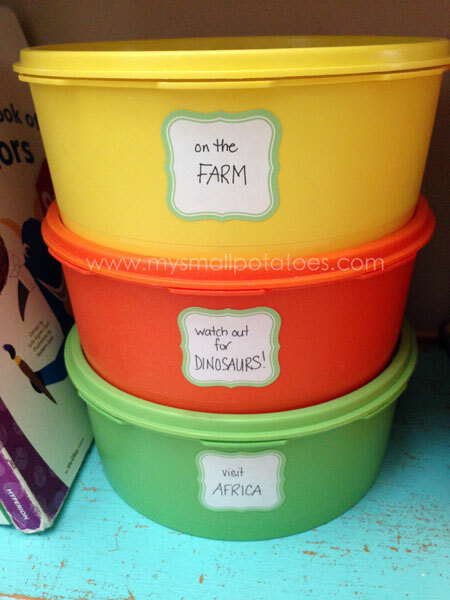 When I designed these portable bins, I had the younger crowd in mind. Gluten-free oats, and cornmeal are great for the babies and toddlers, while the un-popped corn is more suitable the older toddlers. All the toys are big enough that they won’t be choked on, but small enough to fit in the smaller containers. 1. Visit Africa…gluten-free rolled oats, a clear container and lid, a tiny spoon, and plastic baby animals from Africa. These little baby animals come from the Zoo Babies Toob by Safari Ltd.
2. 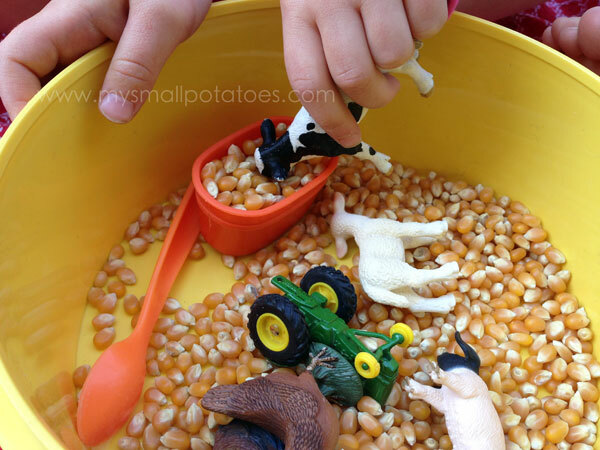 On the Farm…Un-popped corn, a little plastic feed bucket, metal tractor (from Peavey Mart), and plastic farm animals from Schleich. 3. Watch Out For Dinosaurs…yellow cornmeal, a clear container and lid, a tiny spoon, and plastic dinosaurs. 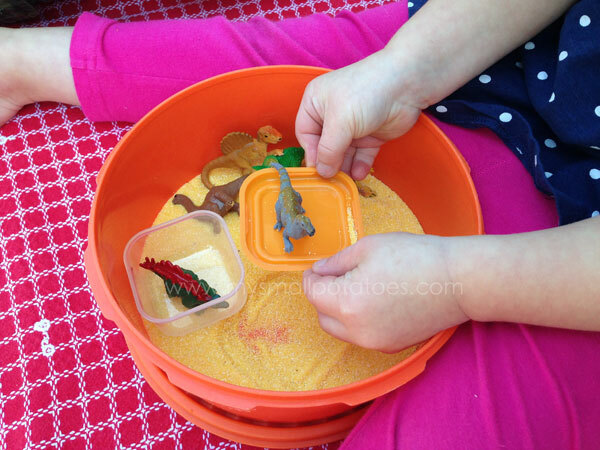 The dinosaurs are from the Dino Babies Toob by Safari Ltd.
*I almost always add a spoon and some sort of cup or container to our sensory bins. Babies and toddlers like to fill and dump…it’s in their DNA. 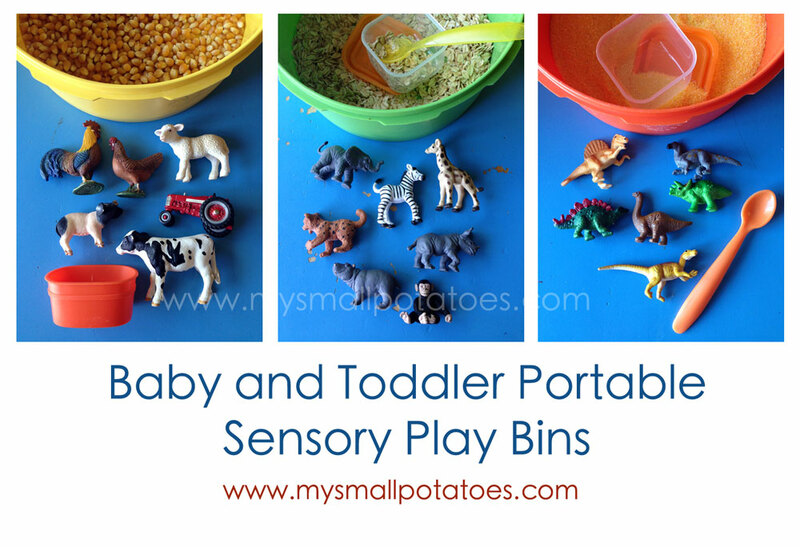 You will get so much more life out of your sensory play bins by adding these 2 simple things. 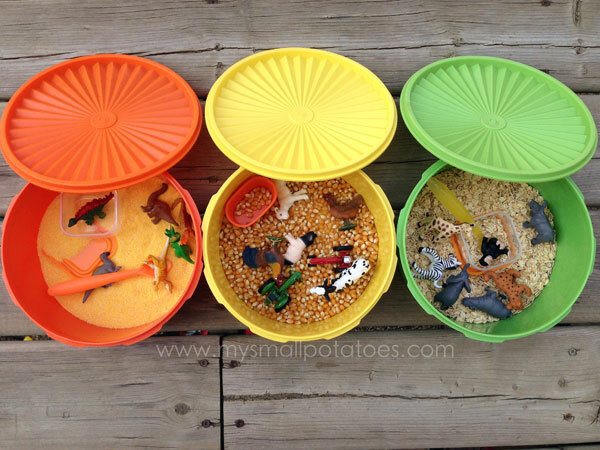 I used vintage Tupperware containers I found at the thrift store for our play bins. You could use any small container with a lid. I prefer round ones, as they naturally fit between a small person’s legs when they are sitting. The key to creating baby/toddler safe sensory play opportunities is to keep things simple, colourful, safe, and interesting. Change things up once in a while. Babies and toddlers get bored just as easily as big kids. Take note of what your toddlers are especially interested in ( at the moment) and design activities in that same bracket of interest. Oh, and don’t spend a bunch of money. If you are purchasing materials, try to buy things that can be used for MANY different activities…not just one. Now go and play, and have a happy weekend! Perfect, simple, and inspiring! Thank you! How long do they last before they go bad? I did one with Rolled Oats and there was ants in them in a month or so. it was in a tupperware container similar to what you have. awesome! Thank you! I will do the one with popcorn! Love your blog!!! This is absolutely brilliant, I love it. And such a great sensory and educative activity for the little ones. I agree, just because it’s going to get messy doesn’t mean you shouldn’t indulge them in one of the best opportunities for them to learn! I’m going to have to try this for my little guy! These are such great ideas! I wish my kids were still little. I’d definitely be putting together bins. We used to have a big container filled with uncooked noodles, beans and rice and my little ones loved pushing their mini dump trucks and backhoes through them. Of course it always made a big mess, but it was well worth it. I can still hear them asking for noodles, beans and rice. You are right, babies and toddlers love filling things up and dumping them. I will have to save your idea for grandchildren! Great ideas!! I’m always looking for new things to do with my two toddler boys, thanks!! This is a great idea! Going to try this this week! I love this idea! I am expecting my first child in November (wow…next month!) and am collecting all sorts of ideas for my little guy. I will definitely enjoy more of your creativity! Great sensory activity! Kids learn so much through the sense of touch! Activities like this can be great to help picky eaters become comfortable touching different foods and textures, too. Great ideas! I love the covered container idea so you can pack it up and come back to it later. 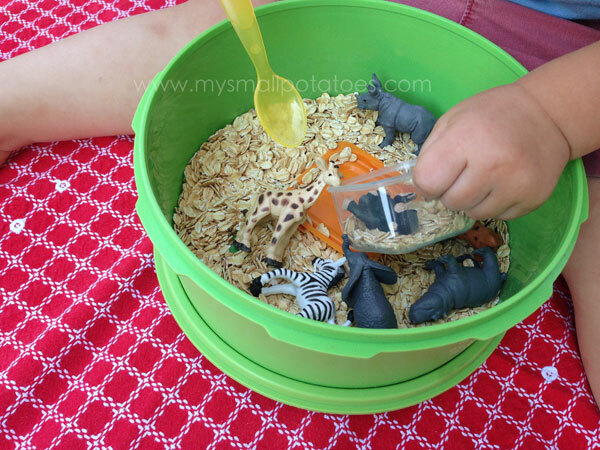 When my two older kids were into sensory play, I put animals into one bin with rice and large puzzle pieces in the other for my older child. It helped level out the activity a bit. It’s me (@buckwheatbasics on Instragram)!! Hi, friend. 🙂 I’m thinking about making bins for my daughter and you’re the one and only place my brain thinks to go. She’s 10 months old right now and I’m curious what age range you think these would be good to start on. Hi there!!! You can start as soon as she can sit up, so I’m sure she’s already long past that milestone! You can use rolled oats, puffed rice, even the edible sand made with flour and cooking oil…anything that is taste-friendly and she won’t choke on. Start simple with cups and scoops and she’ll be thrilled! !